ETA: After some, ehem, confusion, I wanted to add: The raccoon is snuggling, not having his way with, the pig. It was a cold night. So get your mind out of the gutter. You know who you are. A weird little post today. So I've been researching animals. It started with pigs and this piggy prototype. And evolved into other animals; cats, mice, bears, and, raccoons. On the search for images of raccoon faces, I found this: Charles the Raccoon. This fellow found refuge in a barn with some pot-bellied pigs on a cold night at Cedar Row Farm Sanctuary, and then stayed. I love it that he is named Charles, like DH. Check out some of their other residents, it reminds me of Charlotte's Web. Especially Jimmy the Pig. 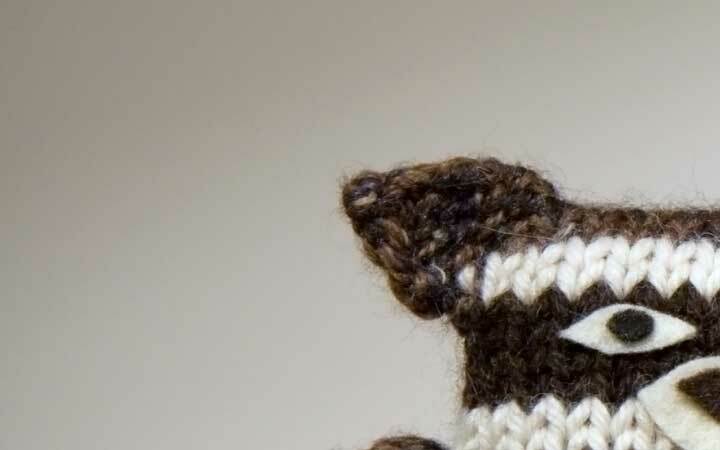 Here's a sneaky picture of a knitted bandit, more on him later. And now Rocky Raccoon is stuck in my head. And, in keeping with the critter theme, I just got another spam email from a Russian, um, single lady, who for some reason wants to send me a picture of herself (I've been getting a lot of these recently, my email must be on a list). Or hey, who knows, maybe Russian escorts are really into knitting. The English is so weirdly translated, she tells me she is "cheerful, kind, sociable and fluffy". Not the usual pillow talk.